February 5, 1778. The Continental Army was tired, hungry, poorly clothed, bleeding, and badly beaten. General George Washington kept the troops in check with regular lashings and threats of the firing squad for desertion. A long, cold winter was still ahead at Valley Forge. Although Congress wanted Washington to fight, he chose to give his men much needed rest and relaxation. The British had the same idea just a few miles east in Philadelphia. The redcoats owned Philly. They were warm, well fed, and comfortably housed in the city. They grew soft after reveling in the New Year and the assumed certain defeat of the Patriots. Later that day, Prussian General von Steuben arrived at camp. R&R turned into regular and routine training at the hands of the professional soldier. Valley Forge transformed from a suffering encampment to the most badass army the world has ever seen. A few months later, Washington marched the fit and ready troops to Monmouth where the tide of the American Revolution finally turned in favor of the rebellion. February 5, 2017. Alex, one of the founders of the Philly Spartans, beamed with pride in knowing that bit of history. He was mysteriously clad in Prussian blue. The other teammates groan, knowing another tough workout was about to begin. Clearly, with a training ground like these hills at Valley Forge, I quickly saw why they seemed so eager. Sunday morning is normally a “No One Left Behind Run” for the Philly Spartans. There was no need for concern. This gang climbed as one, stopped halfway for ten burpees, then finished the next quarter-mile ascent in perfect cadence. It was early in the 2017 season and they were already a well-trained unit. The team is well-balanced between pros and newer athletes. They have a lot of podiums to their credit, both team and individual. They also have their eyes on bigger prizes. Joan started out two years ago as one fearful of holding up the team. Today, she led the charge. 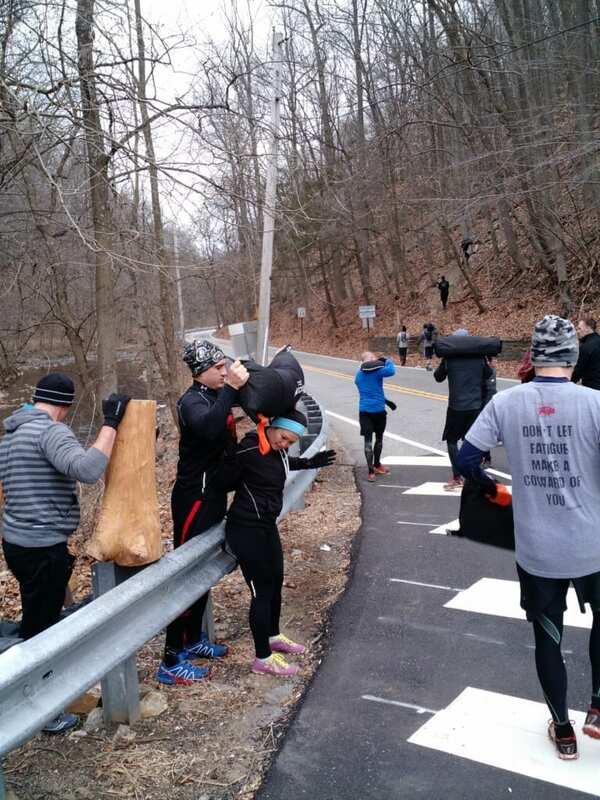 Like from a hidden stash of muskets, everyone grabbed a heavy carry item and started the hill assault. She grabbed a 50-pound Wreck Bag, nearly half her body weight, and started the half-mile steep climb. She talked to me the entire way without so much as a gasp. This year, Joan has eight Trifectas already scheduled. Lulu is right with her. Last year, Lulu was the points leader for her age category on Obstaclemaniac. Her goal is to inspire more women to join the OCR brigade, get healthy, and live by example. Her expectations are high. She is aiming for women twenty years her junior. I thought I had the age award wrapped up at 55 today. Lulu has me beat, and not just in age. She told me about one of her first races where she was near the end but totally out of gas. She sat for a rest, her sandbell next to her. A young male athlete came by. He asked if she was okay. “Yes.” She expected him to move on. He asked if she needed help. “No.” But she didn’t get up. Exhausted, she refused. Still, he didn’t budge. Neither did she. Seriously? Inspired by the huge heart of this guy, Lulu stood up, grabbed her sandbell, and finished strong. That is why she loves this sport. That is why they all love this sport, and one another. They are a tight group. No one is left behind, no matter what. The second stop of the run was at a picnic grove. It was turned into weightlifting 101. We shoulder-pressed the tables, did pull-ups on the low tree limbs, and banged out more burpees. One guy seemed a bit more intent on his burpees than the others. He actually seemed to like them. I asked him why. He’s hungry. He enters the Masters Division this year. He wants a podium. He’s training in the right place. So is my friend John. We train together every weekend. He’s getting ready for his first Spartan ever coming up in July. You guessed it. Palmerton. Valley Forge was his first time on single track and competition-like terrain. He loved it. As he rubbed the outside of his knees at every break he told me, “We’re coming back here to train.” Steuben would be proud. I asked the team what other training regimens they do here. Some days they focus on hill sprints. Joan was one of those who started out unable to sprint a single hill. Nowadays ten repeats for her is typical. I noted a deep gorge in one gloriously enticing area along a trail. The notch cascaded about a hundred feet on both sides. Karl assured me that this, like many other areas on and off the trail, have fallen beneath the feet of the Philly Spartans as they double-timed between Mts. Misery and Joy. And not just the trails. The landscape is bi-sected by little creeks traversed by stone and covered bridges. Such structure is irresistible to OCR folks. A few brave men made the thirty-foot hand over hand across the narrow iron main beam, the frigid waters about a fifteen-foot drop below. Another stone bridge further upstream sometimes serves as a convenient structure to hang various rig grips. Sadly, we did not do that this time. The six-mile run was over too quickly. Everyone was still jazzed up. Although my friend and I drove back home, I found out later that quite a few Philly Spartans either ran a second lap or came back later that afternoon for another 4-miler. Should you ever visit Valley Forge National Park, I hope you bask in its rich history. I also hope you bring your OCR shoes. As you go by the monuments, markers, and makeshift log huts, don’t be deceived. That woodpile you see is not a reminder of the winter of 1778. 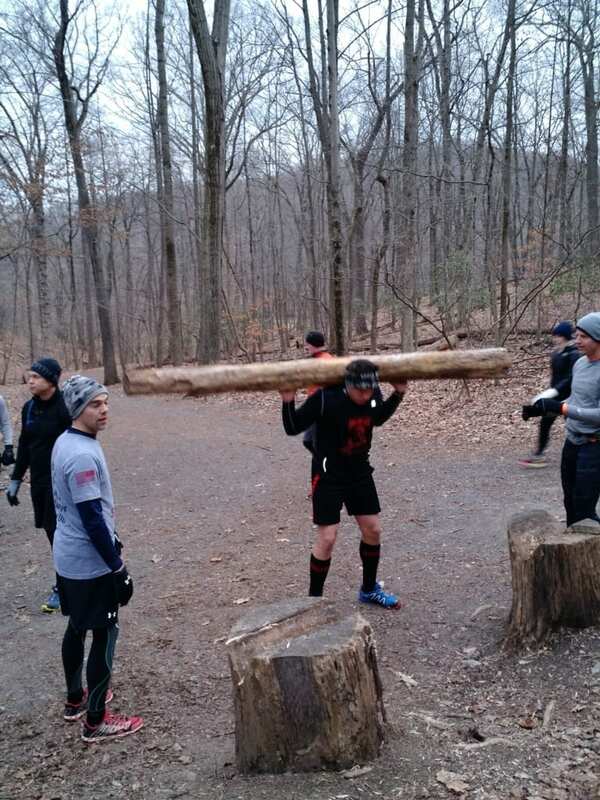 It was likely placed there by the Philly Spartans for carries and squats after long, exhausting hill runs. Only the tourists may imagine it’s a camp prop. After all, this is a tourist destination. And tourists can’t help but wonder what these tough men and women do here in and around the Park, running with logs, carrying sandbells, kettlebells, and Wreck Bags. Karl led me down to the train station where there is a three-foot wall, perfect for box jumps. It sits adjacent to Washington’s headquarters, so the tourist cameras and video recorders tend to be abundant in warmer weather. One such time, the team was doing tabetas on the wall. The crowd loved it. Many captured what happened next. A toe caught the lip of the wall and a nasty face plant now adorns many vacationer’s memory albums. Other selfies and panoramas include Philly Spartans in the background doing what they do best. They are a curious clash with the uniformed Revolutionary re-enactors. Although von Steuben succeeded in drilling the troops into a fine fighting force, I doubt he trained them like a Spartan. The Prussian method included rote maneuvers like the wheel, at arms, and bayonet charges, as well as camp layout, discipline, and latrine digging. I think had he added Spartan training, not only would the war have turned that spring of 1778 in favor of the militia, it would have been over for the British years sooner. For who can stand before the force of Sparta? Philly Spartans are ready for battle and I have no doubt that they will take home many spoils this year. 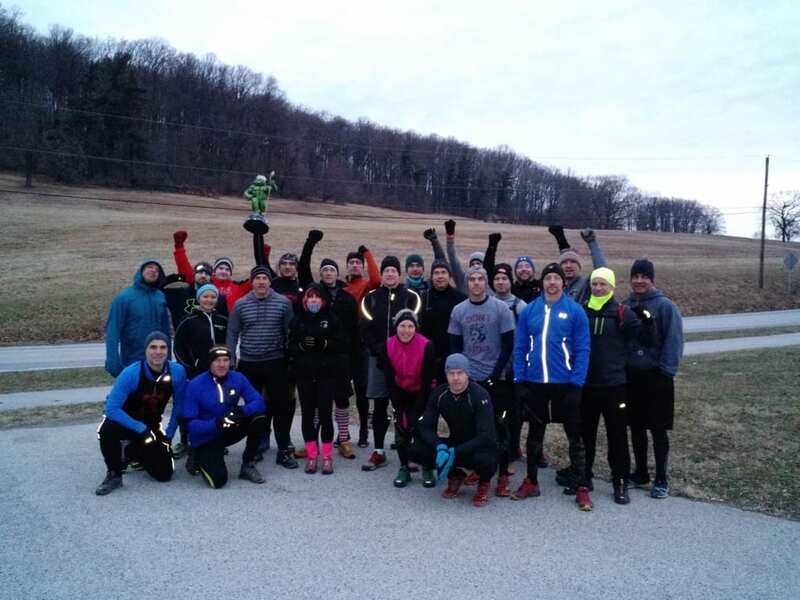 If you’d like to know more about Philly Spartans, you can find them on Facebook or just about any day out on the trails of Valley Forge National Park. After all, that’s where they started, just like so many of us, with a few like-minded people who quickly became best friends, running partners, and finally, a team. Their FB name is Philly Spartans. They are a closed group. But you should be able to see them.